It has always been the case that it is difficult for the average folk to build wealth in a sensible manner. Seldom is it mentioned that equities is also a way of building wealth. POSB has rolled out a regular savings plan for working Singaporeans over the age of 18 to build their retirement funds through investment. With POSB Invest-Saver, savings and current account holders put a minimum of $100 a month into the Nikko AM Singapore STI ETF, an exchange traded fund managed by Nikko Asset Management Asia which last year paid a dividend of 2.1 per cent. POSB account holders can sign up for the scheme online or at any of the 1,100 DBS/POSB automated teller machines island wide. A fixed amount can be invested monthly via GIRO. DBS Bank’s managing director and group head, Tan Su Shan, said that the scheme “allows customers to take advantage of dollar cost averaging and save for their retirement in a smarter way without the need for a huge capital outlay”. So what is this Nikko AM Singapore STI ETF? Enter the Exchange Traded Fund. Nikko STI ETF is a exchange traded fund listed on the Singapore Stock Exchange. In simple terms, it is an unit trust that invest in a basket of stocks, listed on the Singapore Stock Exchange. STI ETF mirrors a group of stocks that constitutes the FTSE STI Index. This STI Index contains the top 30 companies of the SGX Mainboard universe, ranked by full market capitalisation. You can view Nikko STI ETF factsheet here. The advantage here is that previously you need to use a unit trust to buy or that you need to spend a large amount of money to buy. With the STI ETF, you can buy all these blue chips in a single swoop. These are the largest company in Singapore by market capitalisation, so if some of the company became smaller, or some companies out of this index grew to become big, FTSE will replace the smaller companies with the bigger companies. That way should an up and coming company become important in Singapore, you will also participate in its growth. The complaint on the ground have been that the citizen’s do not have an easy way to participate in the country’s progress, that they should allow us to invest in Temasek. Well, now you can invest in majority of those Temasek linked shares at one swoop. When the country does well, the underlying companies that supports the country generally do well. When they make money now, earnings get generated and the value of the companies appreciate. You now have a chance to participate in this progress. I generally favor a passive investing approach with an efficient ETF over unit trust, endowment insurance policy. What do we mean when we say passive investing? Generally, it is an investing approach where we invest for appreciation with minimal maintenance. Many people will think that investing in the stock market requires a second job acquiring a skillset and spending energy on this second job. Often times much methodology such as value investing, dividend investing, trading requires such time and skills build up. A very general ETF can provide that passive wealth building alternative. Just like your bank pays interest rate, the STI ETF pays a dividend. When a blue chip like SPH or DBS earns at the end of the year, they will pay out a portion of what they earn as your stake in the company. The STI ETF, since it is an aggregate of majority of the blue chips, will aggregate the dividends and pay out to you. In the case of my friend, you will see that out of the 21.9% total gains, he earns 8.95% of it as dividends. Dividends make up 40% of his returns. The current prevailing dividend yield based on current STI ETF price is 2.2-2.4%. That is not too shabby and certainly almost equal to the 10 year Singapore Government Bond rate. Remember, dividend payout amount is not fixed. Update (24 Jul ’13): There are 2 ETFs that tracks the FTSE STI Index. One is this Nikko STI ETF, and the other is SPDR STI ETF. I realize that Nikko actually pay much less dividends compare to the SPDR STI ETF. Currently from this point of view, it is less attractive compare to the SPDR STI ETF. The great thing about Invest-Saver is that it allows you to save with a minimum of $100 per month. This is a boon for folks who always say that they cannot squeeze money out to build wealth. You don’t get lower than $100. For those that can go higher do go higher than the minimum! The thing about equities is that you won’t know whether you will be getting –3%, 6% or 9% going forward. You can only use history as a gauge. The total annualized return is 9%. Of the 121% returns 38% of the returns come from dividends. Note: Future performance may differ from the past. By looking at the index above, you can tell that if you are putting your money in for a short duration, you will suffer some big losses. But what if your time horizon is 10 years or longer? My friend was strong in that he did not give in to fear or irrational behavior and continue to add $1000, $1000 till today. This is his result ending in April 2013, which he started in May 2007. You can see that my friend’s commission is 25 dollars and so his “sales charges” is actually 2.5%! That is 150% more than what POSB Invest-Saver is offering which is 1%. His returns till date is 21.9%. I am not gonna minced my words to please people. Short term anything can happen. 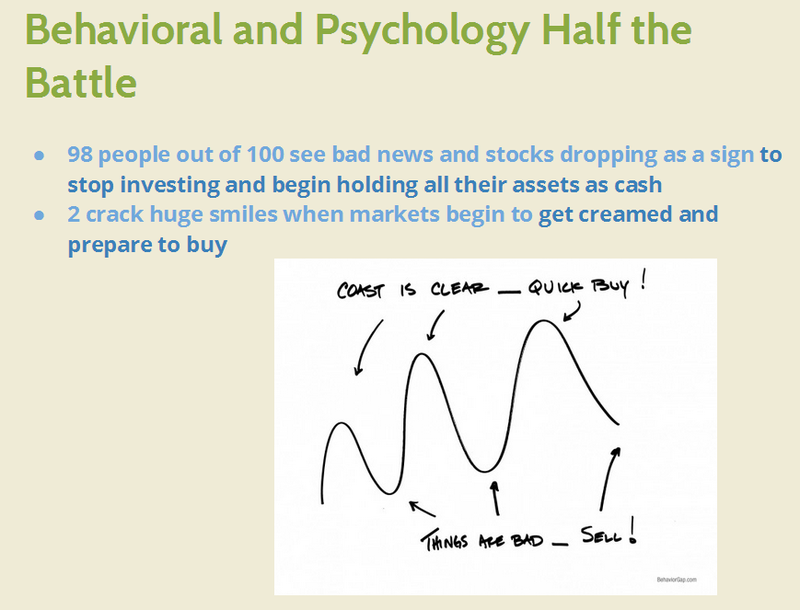 For many folks, the thought of seeing their hard earned cash lose even $1 freaks them out. 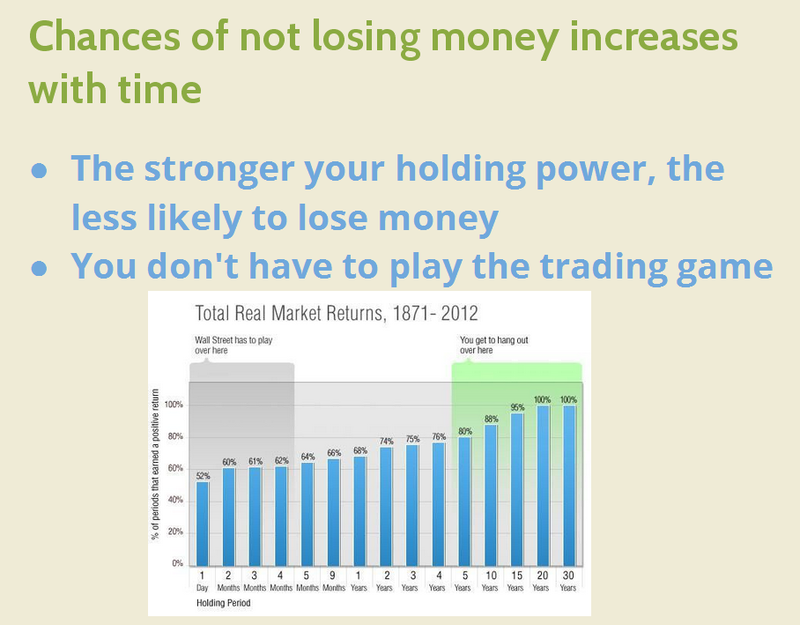 Short term is more or less random; longer term, the odds move in your favor. 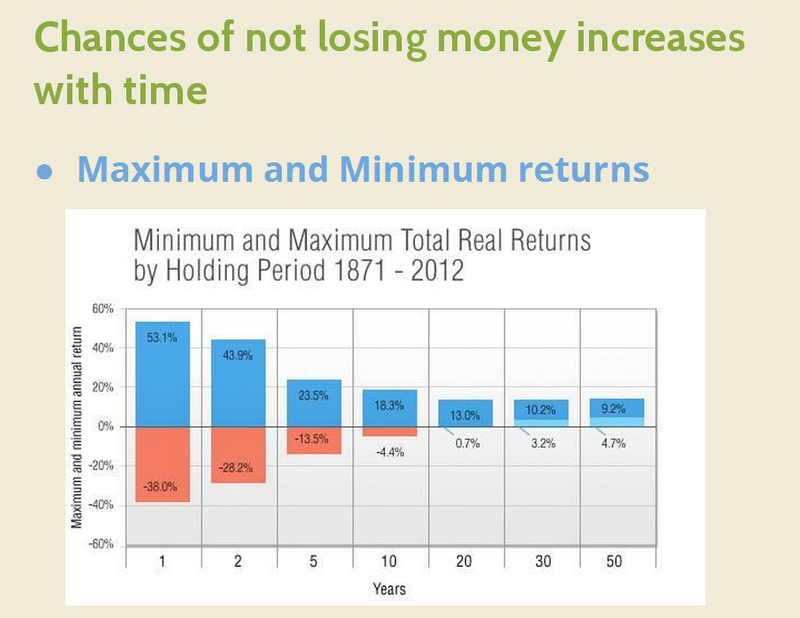 And very long term approaches 100% positive returns, even after inflation. In this total real market return chart for US stock market from 1871 to 2012 (141 years), you will see that on a 1 day, 2 months short term basis, the chance of you earning a positive returns is close to a coin flip. But as you progress up to 5 years, based on historical, 80% ends up positive. 10 years its 88%. The longer your holding power, your odds get better. On a 1 year basis you can get a maximum of 53% returns (wow) or a -38% returns (boo!). To further enhance the case, remember: You are accumulating assets. Would you want to accumulate assets do you want to accumulate them at a cheap price or a dear price? When your time horizon is 10 years or more, bear markets present opportunities to buy cheaply. My friend’s return wouldn’t be as great had he just sat idle. Remember, his highest price purchase was when STI index is at 3800, and after 4 years we have not even cross 3500! Yet his returns are positive! You are investing a stream of cash flow for a large number of years. The previous section analyse when your holdings in a particular year will end up positive after x number of years. But you will be putting money in for more than 10 years. Assume you put in $100 per month which comes up to $1200 in a year. If you are unlucky, the first year you get hit by a 80% market decline, your 1200 becomes $240. That looks really bad, but consider that in year 2, you have another 1200 coming online and investing at a low price. Even if the market continues to remain low for another 2 years, you end up adding 2400 at a low price. When market rebounds after 3 years (which is usually how long a long bear market lasts) you end up having 3600 at a really low price and 1200 at a high price. This is what worked in your favor. A look up of all the leading Singapore Unit trust shows that they are 0.87% upwards. Some even as high as 1.89%! Imagine that all else equal, the future returns of a unit trust and STI ETF is 6% per annum. Before you start earning money, the unit trust will have a hurdle rate of average 1.5%. The STI ETF will only have a hurdle rate of 0.30%. Now we haven’t add in the sales charges. The moral of the story is that your 6% earnings is not definite but costs are permanent, and they will affect your returns. Its not just returns compound, cost compounds as well. 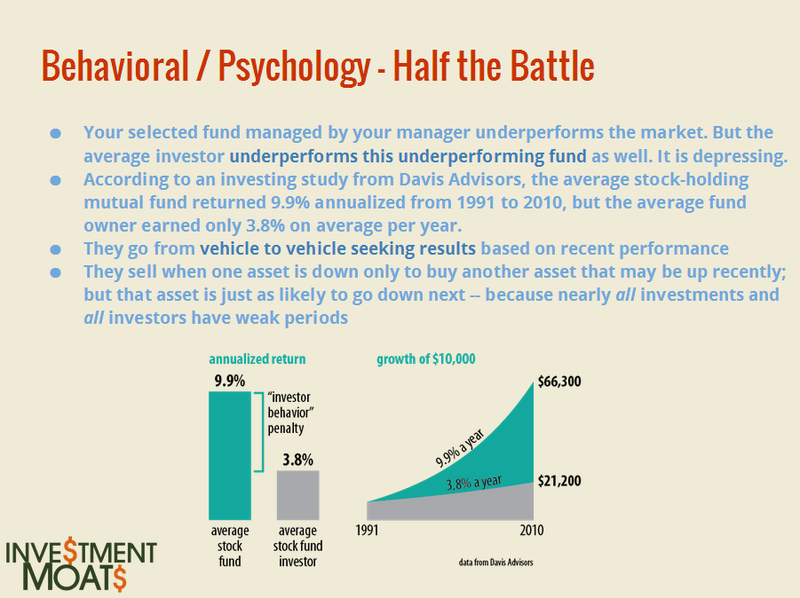 Are you smarter than the market? There are the smarter folks who think they can be better than the market. I mean, surely we can do better than a mechanical index that is managed by a machine right? The truth is that we will suffer from irrational behavior and only a few of us are able to overcome it. It will be better to do what my friend did, which is ignore the market and diligently dollar cost average monthly into the STI ETF. Since 2004, the hedge funds have shown to consistently lose to the mechanical index. They have missed this years bull largely because they took the wrong side. So are you better than these brightest minds? Plan out your disposable income. Decide before spending how much you can divert to building wealth. 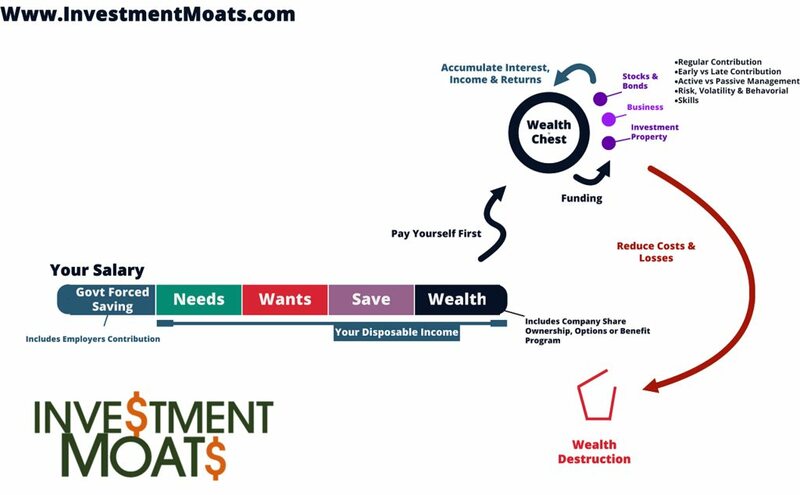 In this case the consistent stream you divert to the Wealth Chest will be invested in Stocks through this Invest-Saver. You will monthly contribute to Invest-Saver. After which, then you plan the rest. So no matter how much you spend, you know that you have already taken care of wealth building. Get Rich – How to pay yourself first: The important first step is to build up your savings. Without a stream of cash flow, you cannot conservatively get rich. Here is how you can build a habit out of it. Saving Money – Divide up your savings: Many folks ignore the different horizons you will need your money but instead treat all saving as the same. Here’s showing you a better method. Three: I have learned to focus on the things I can control and leave the rest to play out, as they certainly will, in an unknown future. What can I control? Expenses, taxes, turnover costs, diversification, asset class selection, to name a few. Most of the rest of what the media focuses on is only noise. I can also control (to some degree, at least) my emotions and my expectations and my discipline. I have learned that it’s extremely worthwhile for me to do so. What you need to take care of are your emotions and expectations. This sounds easy but essentially its very hard. You will be consistently distracted by news that the market is plunging or the market is doing very well. Treat this as a savings. Once you understand this overall plan, there is nothing much to learn. If you must learn about managing your emotional state. A lot of people lost a capital that is dearer than money: emotional capital. It stops you from buying low. Don’t think you are above the average. If everyone thinks they are above the average, then who is below the average? 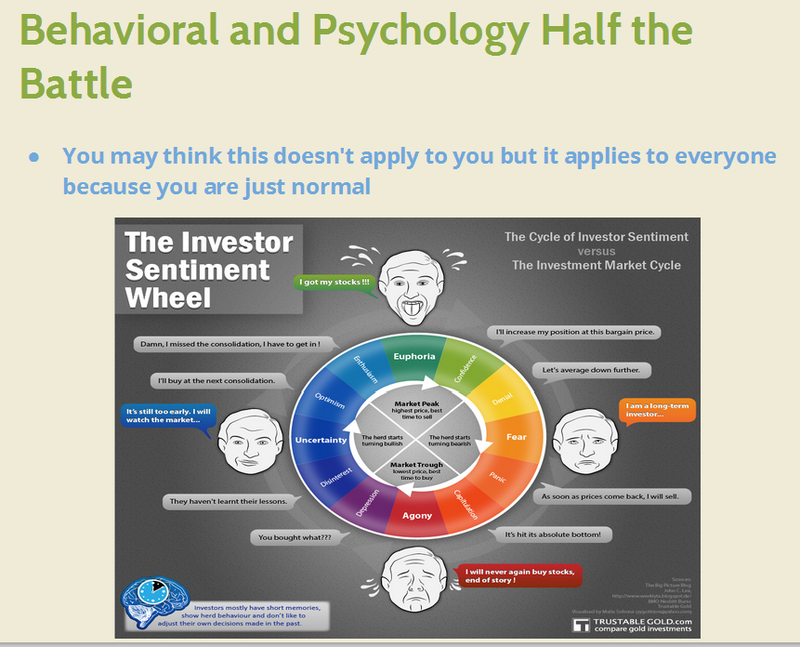 Update [25 Aug 2013]: The market corrects 10% and how do you managed your emotional state? I written an article on it. 3. Get on with life! Basically, it is about not getting a second job. A reader have kindly updated to me that, under POSB invest saver, they will try to invest $100 of what you put in, but because the $100 partly goes to pay the 1% commission, and that they can only buy rounded units to a certain extend, they will not fully invest the full $100. For January 12, the price according to the Quarterly statement is $3.4. The monthly invested amount is $100. Therefore the fee is 1% or $1. The units bought is $99/$3.4 round down to 2 decimal place which is 29.11 (rounding is very important). Therefore they refund us the residual units (0.11 * $3.4) round down to 2 decimal place = $0.37. They also refund us 1% of $0.37 = 0.0037. They will refund us a total of $0.37+$0.0037 (round up to 2 decimal place) = $0.3737, round up is $0.38. So commission will be $1 – 1% refunded of residual units or $0.0037 = $0.9963. Commission in % = $0.9963/$99.62 = 1%! Most importantly we require the price at which POSB bought the units at. It is only supplied via Quarterly Statements. I hope this explains the benefits of POSB Invest Saver. Nevertheless, some things are necessary evil, and I do view it as such. I feel that locally, the unit trust that are actively manage seems to do better than a passive mechanical index. Their long term results do show that. And that 1% sales fee is still not the cheapest. For myself, I use the Standard Chartered Trading with their no minimum commission, I will be paying 0.256% commission whenever I add the Nikko STI ETF. Hope I went through most considerations. If not do shoot any queries you have. what about diversification ? 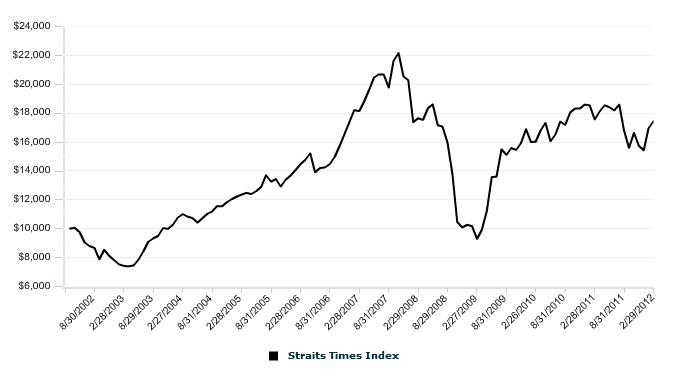 understand that STI ETF do consists all the bluechips in SGX (which contains different industries and therefore, there is diversification) but all in all, the blue chips prices move together in a certain direction in terms of market fluctuation. Hi, good question there and my preference for most is to hold a world stock market ETF such as VT (listed on the US stock exchange) together with a country specific ETF like Nikko STI ETF. Other than Nikko, have you compared vis a vis the other STI ETFs available on SGX, e.g. by SPDR? Is there much difference? So what made you choose NIkko? For your option to diversify via VT ETFs, why not go for those listed in SGX, e.g. SnP ETFs, since at least that be in SGD? i think there are not much of a difference. the tracking error and bid ask spread is almost the same. the issue with other ETF listed locally are a liquidity issue and until that resolves ETF overseas looks better now. of course those etf listed in US have a 30% withholding tax on dividends which can be a drag. Thanks very much for the heads up on this! I’ve been looking to start something like this but put off by the relatively higher cost for POEMS sharebuilder. Do you know if POSB is planning to expand the list soon? Hi anon, thanks for the heads up! I certainly am not aware that the dividend pay out is different! Perhaps it is a payout timing issue? In any case I hope the author did check with nikko why is there a difference. With regards to the expense ratio, I do agree! 0.4% vs 0.3% of spdr is high. I must have confused with the management fee. If this is the case I would rather invest in spdr but the nikko have the advantage in that I can build up wit a smaller amount. So a quick check suggests that Nikko paid 6.5 cents per year for 2011 and 2012 but SDPR was 8 and 9.5 cents respectively. Quite a big difference. Think it might have something to do with the size of the funds? Hi Anon, yes after i did a check i realise there is a large difference! Kyith, this is an excellent article! Keep up the good work! Cheers! I think the author here is a bit bias . He is just simple promoting the product. He only state the good point of the product. The transcation fee itself is already 1% ( 100bps) which is very high in market practic. if the reuturn of 2-3% minus off the 1% transFee, the return is only 1-2%? 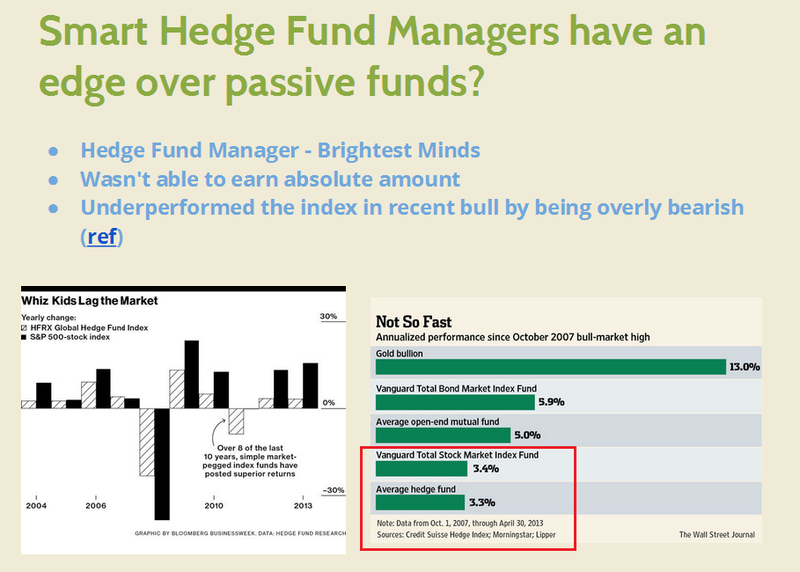 And moreover , buying of index fund using average cost saving will have a must higher return? Thw returns over the long run u should expect is much higher. In the case of my friends example, his cost is 2.5%! I already state as well that I think active managers in Singapore have a rather good edge the last 10 years. Will they mean revert and perform badly next 10 years possible. the 1% fee is only on the buying part, based on purchase price, not selling. some funds charge fees for BOTH buying and selling. eg. i buy 100 shares of ETF at $1 each, the commission is 0.5% so fee is $0.50. i then sell at $1.2, commission is 0.5%, fee is 100 x 1.2 x 0.5% = $0.60. total commission is $1.10. 1) how the component stocks in the STI perform. 2) when u buy and sell. the beauty of dollar cost averaging is when market is down, u buy more, when market is up, you buy less, so that on a weighted average basis, you are more likely to have gains. Dollar cost averaging also works better when u can buy in odd lots so that you buy according to the amount you put in (take advantage of weighting), rather than buy in multiples of rigid lot size. it is good for people who don’t follow the stock market fervently like analysts and stock brokers. it is less stressful. eg. i buy 100 shares at $1. later share price drop to $0.50, i lost $50. but then i still buy $100 worth of it ie 200 shares. my total no. of shares=300. total purchase price is $200. average price is $0.67 per share. If i sell all 300 shares at $0.50, i still lose $50. share price goes up and down repeatedly. say later the price recover to $0.80, I also buy $100 worth of it, i get 125 shares. my total shares is now 425 shares, total cost is $300. if i sell all 425 shares now at $0.80, i get $340, a gain of $40. if i had stopped at buying the initial 100 shares, i need to wait for market to recover to $1 to break-even. yes the numbers in the above example may be too good to be true in real life but it brings out the advantages of dollar cost averaging over time. if buy monthly for more than 3 years, u don’t need to time the market. anytime u are happy with the gains you can sell. by the way, both Fundsupermart and dollarDex don’t offer RSP for Nikko AM STI ETF and SPDR STI ETF. If u buy the ETFs directly, u need to buy in the min lot size for each, which is 100 for Nikko and 1000 for SPDR. i think POSB Invest saver is worth considering because it allows a low entry point to buy STI component blue chip stocks (in odd lots) on a monthly basis. the downside is there is a premium to pay for this accessibility in the form of the 1% fee. hi alvin, thanks for value adding to illustrating the benefit of this invest saver. interestingly i never thought about the sales side (because it was seldom mentioned!). i don’t treat that as a justification this method is cost effective. i think it can be cheaper. the assumption of dollar cost averaging is that in 20 years time the direction should be up. Hi Kyith, really informative post. I was wondering if i could purchase the NIKKO STI ETF on SCB as odd lots? or can it only be purchased as a single whole lot? How much did POSB pay you for this article? Great article. Noted on your updates that SPDR has better dividends payout than the Nikko one. Will you choose to invest (vis SCB trading) in SPDR ETF instead of the Nikko one? Any idea if the stock ticker for the SPDR STI ETF is ES3? Hope the wife and baby are well. I actually do think if we nit pick spdr is the better option via scb. The dividend and expense not to mention tracking error is better. But if u guys want to do it every month small amount scb nikko is a second best option. If I’m looking into purchasing my own NIKKO STI ETF through SCB, I understand that I won’t be able to purchase odd lots. But what do you suggest that I use to fulfil the $500 per month I set aside for the ETF mentioned? I would love to fully utilise the $500 without using POSB Invest-Saver due to the 1% fees. Hi Anon, that will be quite hard to do without oddlots. even then i am not sure if i will advise you to do that. the alternative is to combine a few months transaction and do it at once. you may even be able to buy spdr as well. Hey Kyith, thanks for the reply. Other than what you’ve listed; dividends payout, what are the differences between SPDR and NIKKO STI ETF? Thanks i saw this post at Quantcall. it is pretty good. He is saying too volatile, not many would be able to follow through. Hi Sharon, the difference i see mainly between POSB and OCBC’s offering is that OCBC allows you to invest in blue chip stocks monthly while POSB do not have that option. 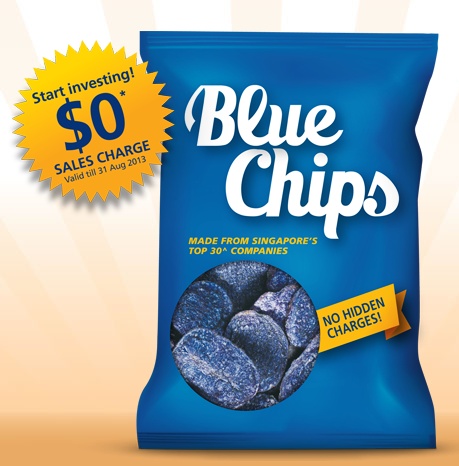 Blue Chip stocks, as mentioned are the large companies in Singapore. Some folks might see them as good long term investments. The cost of OCBC looks higher. This means that if you have $500 it is $1.50 or $5 whichever is higher. So its $5. Its 1%, same as POSB. When it comes to investing, this plan does not mean you get locked in and cannot take out your investment, when i say long term it is that, this ETF will fluctuate in price. In the short run you have a high possible chance you get 10-20% gains but also a -50% fall. You are betting that over 5-10 years, the volatility gets smoothed out and you enjoy a good long term returns. Am i guaranteeing you that in 10 years you will definitely make money? No. Such is the nature of a basket of stocks. You put in higher risk hoping for higher returns. My illustration above have shown that there are times my friend lost money but right now his discipline approach have gain him without being fuss free. This plan fits the kind of investor profile that I highlight above. Excellent write up. All I was looking for is already covered. OCBC for now waive the $5 minimum but I am sure when they revert it will hurt. May I know if the amount of shares in the Nikko AM STI ETF is fixed? what do you mean whether they are fixed? Like for example if I bought $100 worth of shares in NIKKO AM, are these pre existing shares or new shares? Hey Kyith. If I’m only gonna put $100 a month. Should i go with ocbc blue chip investment plans or posb invest saver? ocbc t&c are pretty tricky. Investment Amounts collected from Customers each calendar month. Which means if i were to invest $100 monthly and the share prices were $30. 30 x 3 = $90. i were to lose $10 to ocbc for nothing? whichever is higher . Charges are the same when you’re buying or selling. every month when im buying it will be $5. which means $95 invested. imagine that i have invest for 10 years and i want to redeem it. $12,000 or higher, ocbc will be charging me 0.3%? Kyith if possible please help to look into ocbc plans and do a short comparison. for my case im only willing to put $100 per month. i hope you can help me. just called DBS and realised the commission is actually not 1%. If you contribute 100 a month to the plan, $99 is used to buy the number of full units possible and $1 is deducted as sales commission. The remaining excess amount ($1.50; $99 – $97.5 for this case because 30 units @ $3.25 = $97.5) is then credited back to the savings account the money is deducted from. The actual cost to the investor is then 1.025% or 1/97.5. Not much more but just thought it should be brought up. Thanks for bringing it up. Only now I realize why they “refunded” me some money or what they call “realisation”. This month I contributed $100 and got 29.11 units round down is 29 units. They “refunded” me $0.38 for the 0.11 units. For this month mine’s 1/99.62 = 1.0038%. Agreed not much more but they should have at least informed people about it. This is because POSB refunds us 1% of the value of the residual units. The monthly invested amount is $100. Therefore the fee is 1% or $1. The units bought is $99/$3.4 round down to 2 decimal place which is 29.11 (rounding is very important). Therefore they refund us the residual units (0.11 * $3.4) round down to 2 decimal place = $0.37. They also refund us 1% of $0.37 = 0.0037. They will refund us a total of $0.37+$0.0037 (round up to 2 decimal place) = $0.3737, round up is $0.38. Wah Felix I got to help the readers thank you for this break down. If its not your hardwork, we won’t be able to get this clarity! does SCB carry SPDR or Nikko? does SCB carry out auto reinvestment of dividends? what the min monthly amt i must invest then? does SCB allow partial redemption? apologies for the delay. you are right on all except that there is no auto reinvestment of dividends. If your sum is small Nikko might make more sense. But i find no difference accumulating for a yearly lump sum purchase. Very thankful to have found your blog, you really provided a wealth of information. I am looking to start my index investing after using fundsupermart for almost 5 years. I am thinking of DCA of $500 a month and rebalancing yearly. Through POSB Invest-saver, i would like to allocate it as (70/30)split. I am a little more conservative. How would I do the rebalancing every year? thoughts? Hi Darte, i actually started from fundsupermart in my education believe it or not. when it comes to rebalancing, especially when you are adding, i tend to determine where i shouid add more to, whether bonds or equity, depending on the allocation. this instead of a periodically rebalance back to the target. the general rule is that if i start off with a 50/50 allocation, the moment its x% away from that, then i rebalance, else i do nothing. Very well informed write. I am a new and noob beginner when it comes down to this. This helps me to better understanding the differences before really getting in. Somehow i am curious the nick is more of a spam or a real person. I was just wondering if buy direct charges from POEMS will be the same as I buy from POSB Invest Saver? I think in all cases, cost is an important considerations and it depends on your sizing. I would prefer you guys go lower than the 1% for POSB InvestSaver. If poems sharebuilder or other programs enable you to do that, its a strong consideration. Sharebuilder if I am correct do the kind of GIRO deduction as well. 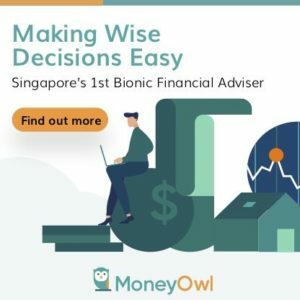 the advantage of POSB Invest Saver and Sharebuilder is that it minimizes the need for you to make decisions, thereby stopping you from doing rash things. If you can find a lower cost but needs you to make a buy decision, you got to really understand what this way of investing entails. Else you may end up harming yourself more. how i do RSP at the lowest cost for SPDR STI ETF? POSB and OCBC only have NAM STI ETF. Hi Foo, you can use standard chartered online trading where they don’t have minimum trading commission. so you can buy 100 shares of sti etf for around $300 and your commisison will be 0.25%. unfortunately you cannot do this automatically. First of all, I have to say thanks to this blog. It does give me valuable investment knowledge and experiences that I am grateful for. I also started my investment with unit trusts but I have liquidated most of them, leaving only one. 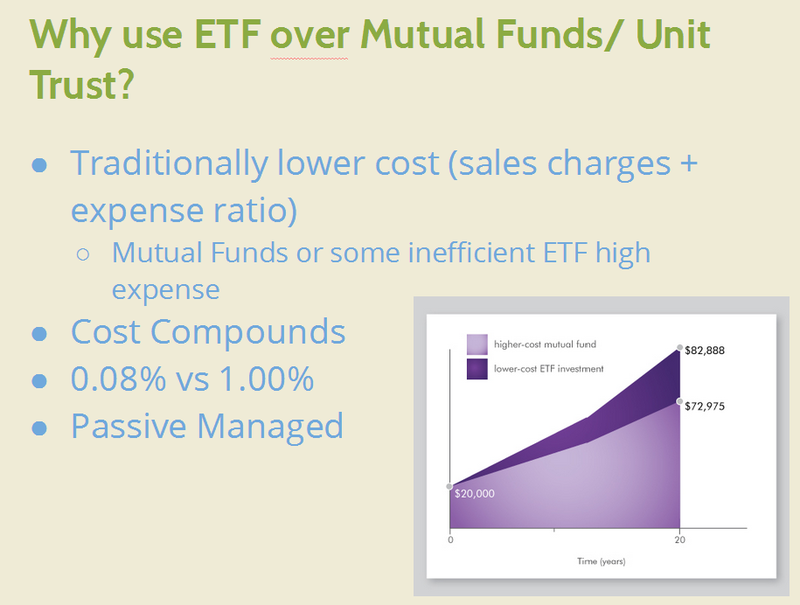 It is true that through comparison ETF provides lower costs (vs Unit trusts). In addition, it is again true that I do not have so much time to monitor market movement. I have some funds in CPF-OA. In view of limited time and financial knowledge. I am contemplating in putting all my CPF funds into STI-ETF and world stock market ETF and let funds grow there. Would you agree with the above? Would appreciate your views. Thank you. Hi SpringFlower, it is great to know that. I think you will find that the management of such a simple portfolio to be more refreshing. i was about to say its not areally a good idea to have all in sti etf, and you mention world stock market etf. my question would be how to get that exposure with ETF on CPF OA. I do not have a good solution for the currently. Great article! I have a few questions in mind and wonder if you got any suggestions to them? My main concern for i.) POSB RSP in STI is not going to provide me any diversification outside of Singapore. The 1% charge is also higher as compared to Standard Chartered. Concern for ii.) is will i be able to achieve dollar cost average given that if were to invest once every 3 months (1,500). Will this be more cost effective and how will my returns be affected? 1500SGD is able to get me 5 lots. Will it be the same as dollar cost averaging if i were to purchase 5 lots every quarter. Can you let me know how you’re investing ETF using SCT. Option iii gave me the diversification i am looking for but is the FX exchange rate worth it? I was told that SC gave a very poor exchange rating for SGD/USD. Will be helpful if you can provide me your opinions. Thanks for the article! Was reading through the post and just have this query. For standard chartered online trading, while there is zero commission charges, what happens in the event that the entity is no longer solvent? I am of the understanding that unlike other brokerages, standard chartered does not keep your holdings in a cdp account. Hi Jackson, Standard Chartered Online Trading have a minimum commission of $10 already. This is a 2016 change. If SCB gets into trouble, theoractically your money is held by a trustee who acts on your behalf. The government can designate another bank or institution to take over. This you do not have a choice. It should be noted that CDP is only for Singapore based shares. For overseas ones, the custodian is always your brokerages, which is why there are dividend handling fees and custodian fees. Thanks for the reply and update! Much appreciated. I am looking at diversification for other foreign etfs. Planning to use the dollar cost averaging strategy, invest $2500 every 3 months to cut down transaction costs($25) to 1%. I understand that us market has a withholding fee of 30% thus am not looking at that for now. As investing in foreign etf there is currency risk as well. Some countries also have certain fees. Hence, i would like to ask if theres any relatively low cost foreign etf that you would recommend? I am planning to invest for long term of at least 10 years. Hi Xin, if your plan is to accumulate to invest quarterly so as to minimize expenses, you might want to go for a cheaper brokerage. Since your choice is to purchase the ETF on an overseas exchange, than it does not matter as foreign shares, regardless of brokers are not stored in your CDP. There is a 30% dividend withholding tax, and of course some exchange such as USA, London have estate duty/death taxes. However you get to access to ishares and vanguard ETF which have low expense ratios. Another possible consideration is the vanguard ETF in Hong Kong stock exchange. They do have dividend withholding tax but should be exempted from estate duty. The currency risk…. is subjective. If you purchase a stock listed on the SGX such as riverstone, whose raw materials are in Ringgit and income is in USD, you also have currency risk. The ETF is somewhat the same. Imagine you buy a ETF denominated in USD that covers only 2 countries Korea and Japan. You have to switch the USD twice. You exchange your sgd to usd to buy the ETF. The manager of the ETF would need to take the USD to buy the stocks in yen or korean won. If USD severely depreciates, your SGD buys more USD, but if all else remain equal, you need more USD to buy the same amount of Yen and Korean won stocks. So the currency risk is between SGD and the underlying stocks. Pardon if this is a dumb question, but in order to use the Standard Chartered online trading I would need to open a savings account with them right?